Lid requires a bit of effort to lift up and close down. Water comes out in an uneven stream. Filter is difficult to remove and replace. 29 Jun 2018, Gabrielle D.
For this price you couldn't get much better. It boils quickly and quietly, and holds a decent amount. 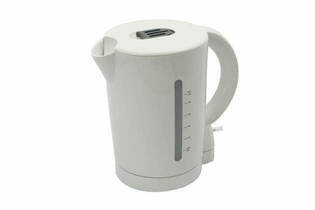 It's very lightweight, so isn't difficult to carry a full jug's worth of boiling water around. The base is quite light and flimsy, and sometimes picks up through the air if you pull the kettle up in a rush to refill it, but it's all good, and is so simple it's fine.